One of the Democratic candidates for the Wisconsin governorship made a major gaffe on an issue his state prides itself in the most: beer. "Andy Gronik's favorite Wisconsin beer — well, it's not actually a Wisconsin beer," reported Capital Times Friday morning. "Favorite Wisconsin beer? Um, I'm going to have to go with Blue Moon. Blue Moon is a Wisconsin beer, no?" Gronik said during an interview with the Cap Times‘ Jessie Opoien. Blue Moon was originally brewed in Golden, Colorado, and is today brewed in Montreal, Quebec. Blue Moon Brewing Company's parent company MillerCoors does operate breweries in Wisconsin for its Miller and Leinenkugel products, but not Blue Moon. "Oh no!" Gronik responded when Opoien informed him Blue Moon wasn't a Wisconsin beer. His second choice was "the cow one." 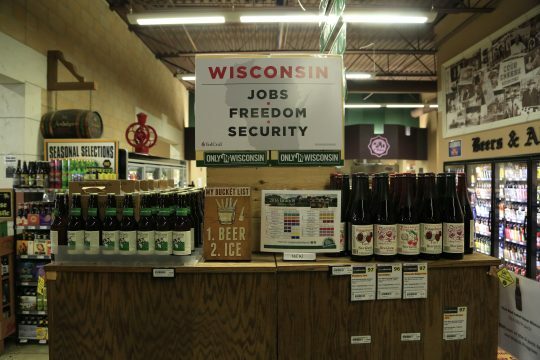 New Glarus' Spotted Cow is a Badger State staple, not available for sale outside Wisconsin. Former Democratic gubernatorial candidate Mary Burke called it her favorite beer during her 2014 run, while Republican Gov. Scott Walker named Leinenkugel. Perhaps his unfortunate taste in beverages explains why Gronik, an outside candidate with a history in business, is currently polling dead last among Democratic candidates. The winner of the August primary will go on to face Walker, who is running for a third term. This entry was posted in Politics and tagged Scott Walker, Wisconsin. Bookmark the permalink.